Welcome to the homepage of the Williamsburg Heritage Dancers! We’re a community-based club that meets weekly to learn and enjoy English Country Dancing, a form of social dance that is accessible and fun for participants of all ages and experience levels. English Country Dance offers beautiful and lively music, dances both graceful and energetic, and the company of friendly people. Come join us Tuesdays from 8-10 pm at Newport House Bed & Breakfast, which is located at 710 South Henry Street in Williamsburg, VA. (Look for the big yellow house on the corner). All are welcome; no partner, previous dance experience, or registration is required. We start with easier dances and work up to more complicated material, so if it’s your first time attending, we recommend arriving by 8 pm. Parking is available on Mimosa Drive, just south of Newport House. (Signs say that parking is reserved for residents, but on Tuesdays we have special permission to park there). A map can be found on our “Directions” page. 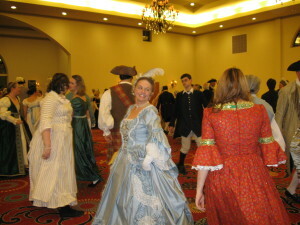 Dancers in colonial costume at our annual George Washington Ball. While many attendees enjoy dressing up for the ball, at our weekly meetings we dress in casual clothing – t-shirts and jeans are fine!